Garrycastle full-back John Gaffey blocks the run of The Downs forward Luke Loughlin during last weekend’s quarter-final. The business end of the senior football championship has arrived with the two semi-finals down for decision this weekend. Twelve teams started out in the quest to get their hands on the Flanagan Cup, only four remain. Amongst them are reigning champions Mullingar Shamrocks who will put their title on the line against a potent Tyrrellspass. Also the blue side of Mullingar will be hoping Declan Rowley’s men can conquer the most decorated team of the past decade, Garrycastle, and possibly set up an all-Mullingar final. Early in the year I fancied Michael McDermott’s side to go all the way in this year’s championship. On paper they still have an impressive side. Injuries have however taken their toll and I now have a feeling Shamrocks will retain their title. The action gets underway at 2pm on Sunday in Cusack Park when Garrycastle will be determined to prove their doubters wrong against the form team of this year’s championship St Loman’s. The green and reds will not be lacking in motivation having been walloped when the sides met in the group stages and are sure to be aware that many around the county have already written their epitaph. Their narrow win over The Downs last weekend in the quarter-final was far from convincing and this has to be a major worry against a team of Loman’s calibre. There are many factors which makes this game intriguing. Garrycastle have been there, done that - Loman’s haven’t - Garrycastle know what it takes to win championships. Do St Loman’s? Can Garrycastle go to the well once more and dig out a winning performance as they have so often in the past? Will Loman’s flatter to deceive once more? 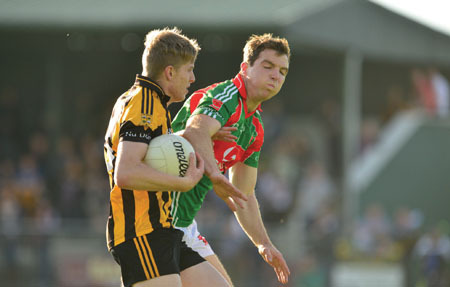 How will The Castle cope if Dessie’s hamstring or Paddy Mulvihill’s Achilles give way? What if Heslin’s influence is curtailed? Form and momentum cannot be ignored in a semi-final and St Loman’s hold the edge here. A slight question mark over Paddy Dowdall is their only concern while their counterparts have plenty of worries. Dessie Dolan was forced off with a hamstring injury last weekend and while it is not torn he is unlikely to be moving freely. Paddy Mulvihill has missed a lot of football lately with an Achilles injury and while he was introduced last weekend he is unlikely to be firing on all cylinders. John Gaffey was hospitalised last weekend with a back problem and while he is likely to play, a doubt remains. The vibes are not great overall from the Garrycastle camp. Loman’s on the other hand are chomping at the bit. They beat Kildare’s Moorfield in a recent challenge and will see this as a great opportunity to make the decider. The bookies have Loman’s as slight favourites (10/11 ) and it is hard to disagree with that. Garrycastle’s difficulties can be Loman’s opportunity and I expect them to grasp it with both hands. The second semi-final has all the ingredients of a cracker. I expect Shamrocks’ better balanced side to edge out a Tyrrellspass side capable of putting up a score. Tyrrellspass rely heavily on Ger Egan at centre back and the two Glennons and Martin Flanagan up front. Shamrocks are physically a very big side overall and particularly strong down the middle. Denis Coroon and Daly will give them a definite edge in midfield which will prove vital. Tyrrellspass have the forwards to do damage but only if they have the ball. I don’t expect Shamrocks to be in generous form as they bid to retain their title.